A DIY Artificial Pancreas System? Are we crazy? The Do-It-Yourself Pancreas System (#DIYPS) is a tongue-in-cheek name that recognizes a serious fact: people with (type 1) diabetes (PWDs) have been acting as their own pancreas for years. What a healthy pancreas does using subcellular machinery in islet beta cells, and a full closed-loop artificial pancreas system (APS) attempts to do automatically using medical technology, are the same things that PWDs have been doing, on their own, with whatever help they can get. We recognize that for many PWDs the available help is not yet enough, so we are not waiting. Medical device companies are working on new Artificial Pancreas Device System components, and researchers are conducting clinical trials of artificial pancreas systems incorporating various levels of closed-loop technology to do anything from automatically suspend basal insulin when BGs are below a pre-set threshold (available now in the Medtronic MiniMed 530G) to a fully closed-loop bionic pancreas system that automatically doses insulin (and even glucagon, in one trial) to provide full 24/7 BG control. However, full closed loop systems are still years away, so there is a serious unmet need for better tools to help people with diabetes manage in the meantime. The #DIYPS is designed for immediate deployment, using a device-agnostic web-based interface, and optionally ingesting data from any of a user’s existing medical devices using commodity off-the-shelf hardware (such as a Moto G Android phone connected to a Dexcom G4 via USB). In fact, interactive use does not even require automatic data upload capabilities: once the system is configured for their insulin sensitivity and other user-specific parameters, a user with any sort of CGM or meter can manually enter BG levels, boluses/injection amounts, and carb counts and get an immediate estimate of their resulting BG levels. In addition, the system will estimate insulin on board (IOB, meaning insulin still working in the body) and unabsorbed carbs, so a later follow-up assessment only requires updating the BG data to figure out if any additional action is required. The #DIYPS can be used immediately to empower PWDs to prevent many instances of out-of-range BG levels. The #DIYPS is not a substitute for a true closed-loop Artificial Pancreas*. It is not a medical device, and does not dose insulin. However, it does fill two currently unmet needs. Firstly, none of the CGMs on the market currently support robust enough alerting features to awaken many patients when they experience low BG while sleeping. Such nocturnal hypoglycemia unawareness is a serious risk for many people with diabetes, and better tools are required to deal with it. The MiniMed 530G’s Low Glucose Suspend feature is a huge step forward there, but even it doesn’t help with the converse problem: at other times users will end up going an entire night with high BG, and never wake up to their CGM’s high BG alarms. The #DIYPS’s alert system certainly cannot replace a CGM’s alarms (it’s not a medical device, and various interruptions in connectivity can prevent it from alarming), but it does have the ability to send notifications that can trigger alarms (i.e. on an iPad or phone) loud enough to wake the deepest sleepers. It can also function as a de facto remote alert or monitoring system, allowing family or loved ones in different locations to check and make sure a PWD is responding to alarms. Until device manufacturers get FDA approval for loud enough devices, this alone is enough reason for many people to want to put together their own alerting system like the #DIYPS – and was the original reason for building it. Secondly, it is currently completely up to patients (with occasional help from their doctors) to determine how much insulin is required at any given time, and decide when additional carbs are required to prevent a low. Performing such calculations manually every few hours, without ever being able to take a break, is a major problem for the quality of life of many people with diabetes. There are very few effective tools available today to help, so such calculations are usually done in the user’s head, and are very prone to human error. (The few tools available are also often not in one system, creating barriers for effective use.) In addition, many factors such as stress, sickness and varying activity levels can impact BG levels. This combination of factors often results in frequent (often daily) instances of low or high BG levels. The #DIYPS system provides a framework to support the user in making the best decision in every situation, while reducing the cognitive load on the user, and reduce the risk from harder-to-calculate factors like stress or varying activity levels. It also helps the user to pay more attention and take action when they are at risk for hypoglycemia (predicted based on CGM, IOB, and carb data input into the system), while allowing them to continue living their life normally, with less worry about managing diabetes. Finally, the #DIYPS system is designed to be device and data source agnostic, and to integrate with frameworks like Tidepool to allow users to do things that have never been possible before. As new and better medical devices are released, our hope is that all of them will support methods for allowing a user to export their own data, so that users can truly take advantage of all the innovation we are starting to see in this space. P.S. A special thank you to John Costik, who graciously provided the drivers we’ve been using to pull data off the Dexcom CGM to a Windows PC, and who is working on perfecting the Android (Moto G) drivers as well. We wouldn’t have done any of this if it wasn’t possible to get data off the Dexcom CGM in real time. We’d also like to thank members of the diabetes online community for their support, encouragement, and feedback: we know y’all will be pivotal in driving this forward. *Update in December 2014: We wrote this post in February, when #DIYPS was truly a “human in the loop” decision-assist system. However, as of December 2014, we closed the loop with #DIYPS, and also have a version of #DIYPS that is essentially a closed loop artificial pancreas. 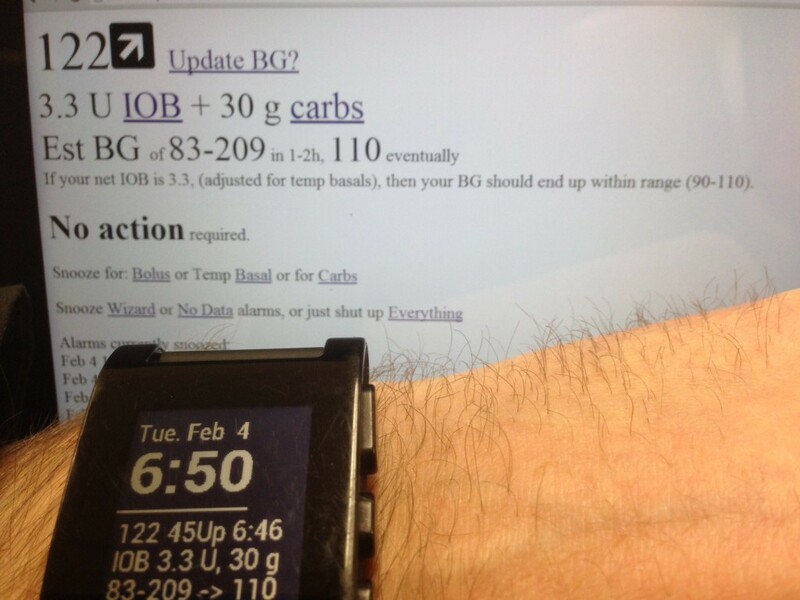 You can read more about our work on the closed loop artificial pancreas version of #DIYPS here. if I was not traveling for the next year you would deff get my assistance with this. Have been wanting to work on my own such project and find others to help. we have the tech, the powerful mobile and knowledge to make this happen, missing part is individuals with the time to dedicate to such a project. How can I follow your progress? Certainly! We’ll be posting the system description soonish, and after that anything related will be on Twitter tagged with #DIYPS. So feel free to follow the blog via RSS, follow me (@scottleibrand) or Dana (@danamlewis) on Twitter, or just check in periodically. And if you do come across anyone excited to help or interested in more detail than we’ve published, have them contact me (scottleibrand@gmail.com). Thanks! Great project! I’m working my way through your various materials now, and we’ll see what makes sense to implement for my 11 y/o son. Remote alarms off the CGM would be a huge win for us in a variety of situations. Thanks much for all your work! Wow. Wow. I am just reading about this tonight! Wow! We are up watching son’s BG after an accidental Humalog overage of 12u. It would have been hard for him to eat enough carbs to meet that, so our endo had us give him 11u of glucagon. I realized hey! We are like the artificial pancreas: little bit of this, little bit of that, try to make it even out. Except our human brains are not quite up to the task. Because we have no idea what 11u glucagon will do. Anyway, how cool what you’re doing for pancreases everywhere! Pingback: NewsFlash: Dexcom SHARE Gets FDA Approval!